How Would You Design a Template for a Visual Facilitation Session? How would you design a template for a brainstorming session? 1. Use the template to track ideas generated. 2. Identify two or three ideas that will be researched for feasibility. 3. Keep track of who would be responsible for follow through on these ideas. Consider how each template reflects different assumptions about how the conversation would be carried out, as well as how ideas are generated. The head image clearly shows that three ideas will be researched. But what about other ideas? Will the meeting end as soon as three ideas pop up? Most likely, yes. We tend to fill in blank space and as soon as the blank space is filled we feel like we have done our job. The seascape shows many fish; most likely many more ideas will be generated. Ideas will then caught and selected and later these ideas might be mixed with others, i.e. put into a sushi roll or cooked into a gourmet meal. This chart makes clear that the goal of the meeting is to generate ideas and then select a few for further research. 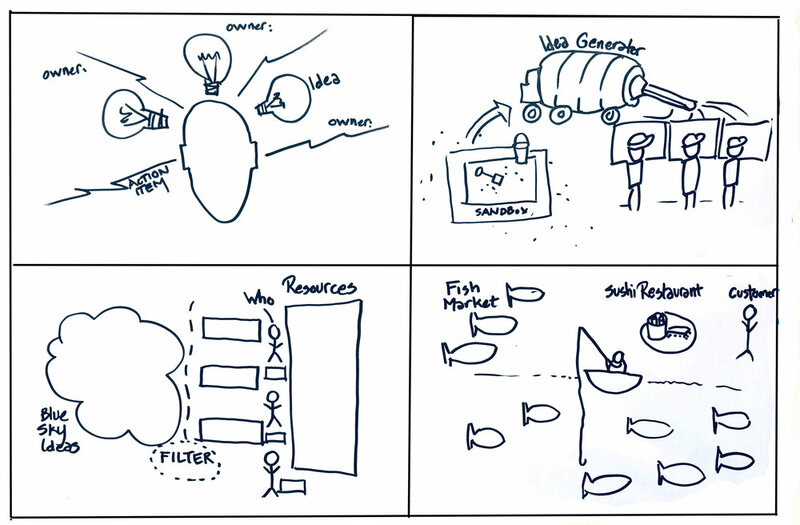 The group that created the cement mixer template understood that brainstorming is not the best way to generate ideas. On this template, ideas are played with in a sandbox then put into a mixer where they may change significantly during discussion. By the time the meeting ends it may be that no one individual can claim ownership of the idea, rather the group generated it. However, note that they do have construction managers to follow through. Finally, let’s look at the box template. For a group that is less open to wild ideas, this template will look reassuring. No one is influencing them with metaphor and everyone can understand the intention and flow of the meeting immediately. This can be a tremendous plus. Three groups, four ideas. Visuals can be extremely powerful!